It's a professional affair midweek at Wimbledon Greyhound track as many of London's vintage store buyers and market stall holders from Portobello to Spitalfields source their stock. Every weekend I hop on a train and travel just outside of London to Essex or Surrey to go searching for cute treasures at car boot sales in big fields. It’s been a really mild Autumn so most have continued but will soon be wrapping up for Winter hibernation. Over the past few weeks I’ve tested out some midweek hard standing London based boot sales which run the whole year round. 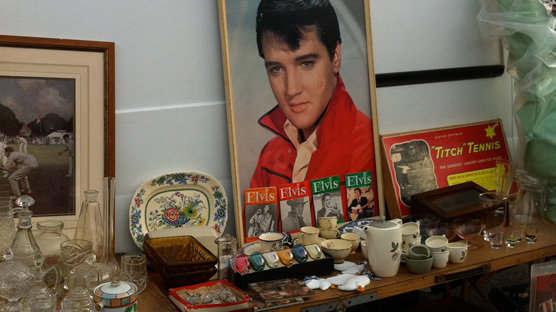 A stall dedicated to the King of rock’n’roll Elvis Presley. By far my favourite, simply because it’s the biggest and I’ve much more chance of finding something, is the sale held at Wimbledon Greyhound track on Wednesdays. It opens at 10.30am and the sellers aren’t allowed to start trading until this time. Buyers, however are allowed in from 9am (paying £5 for the privilege) to stalk around peering into the back of cars. My poor friend Gillian found herself “lurking with a motley crew” for about an hour. 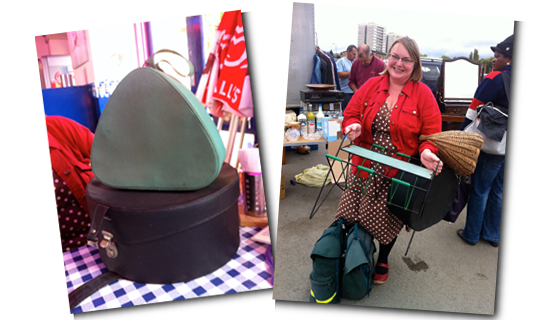 Gillian with her magazine rack which she haggled down from £45 to £20. I arrived at 11am after an unexpected bus marathon took me 2 and a half hours to get there from East London. By this time it was absolutely rammed, so all I could do was roll up my sleeves and get involved. Around the outside of the sale are massively crowded house clearance vans where you pretty much have to get down on your hands and knees and sift through piles and piles of crap in the hope there’s some good stuff in there somewhere and then grab it before someone else does. In the centre and the back car park are a small number of people having a clear out but *mostly* it’s full of professional boot sellers who have bought to sell – probably from an auction. An onsite diner to have breakfast and show’n’tell your finds. 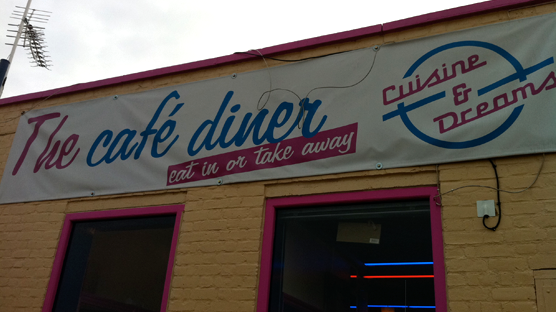 It takes a good few hours to get round the sale and then afterwards I recommend heading to “Cuisine & Dreams” the onsite diner where you can wash your hands (tis quite a grubby boot) and dig into a big breakfast whilst you show ‘n’ tell your finds with your thrifting buddies. A quick word of warning: if you usually go to countryside boot fairs on the weekend then brace yourself for hard standing weekday city ones. They’re busy, full of competitive ‘dealers’ (people who buy to sell) and the sellers can be a tad brusk. 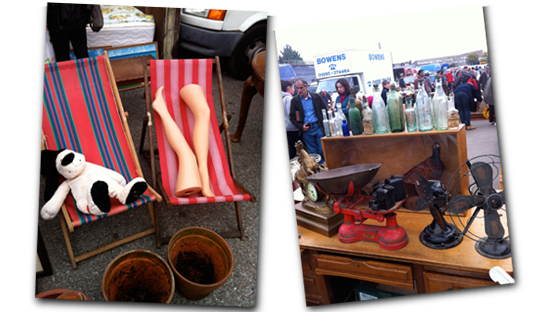 Wimbledon on Wednesdays is the business end of boot fairs really, so if you enjoy a more relaxed amble about maybe go there on the weekend as it also runs every Saturday (from 6.30am) and Sunday (from 7am). I went there this morning and it was much less intense! please inform me of the cost for the mid week car booth sale/ANY OTHER TERMS AND CONDITION.